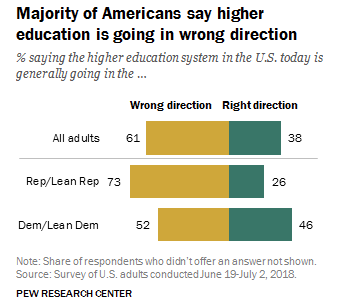 A new Pew Research Center study finds a majority of Americans think higher education is headed in the wrong direction. But there’s disagreement about why – mostly along a partisan divide. While more Republicans think higher ed is headed in the wrong direction than Democrats (73 percent vs. 52 percent), 61 percent of all adults polled held the view. Republicans are more likely to believe that professors are bringing their own political and social views into the classroom (79 percent) and are too concerned about exposing students to things they might find offensive. Large percentages of both Republicans and Democrats think the system isn’t working because tuition is too high (97 percent of Democrats, 77 percent of Republicans) and students are being inadequately prepared for the workplace (73 percent of Republicans, 56 percent of Democrats). Also interesting: When asked about speech issues on campus, 87 percent of respondents said it is most important to allow people to speak their minds freely, even if some students find their views upsetting or offensive. There is basic partisan agreement on that point, with 91 percent of Republicans and 86 percent of Democrats agreeing. That’s somewhat at odds with student sentiments, according to a 2017 Gallup/Knight Foundation poll that found only 56 percent of students said protecting free speech is extremely important to society. Almost half those students said they favor campus speech codes and about two-thirds said the U.S. constitution should not protect hate speech. See the methodology of the study here.